The first free public talk in the new series is titled FORGET HUBBLE, HERE’S HOW DEEP SPACE REALLY LOOKS LIKE! The talks are designed with the general audience in mind, they are fun, easy to understand, short, and engaging. 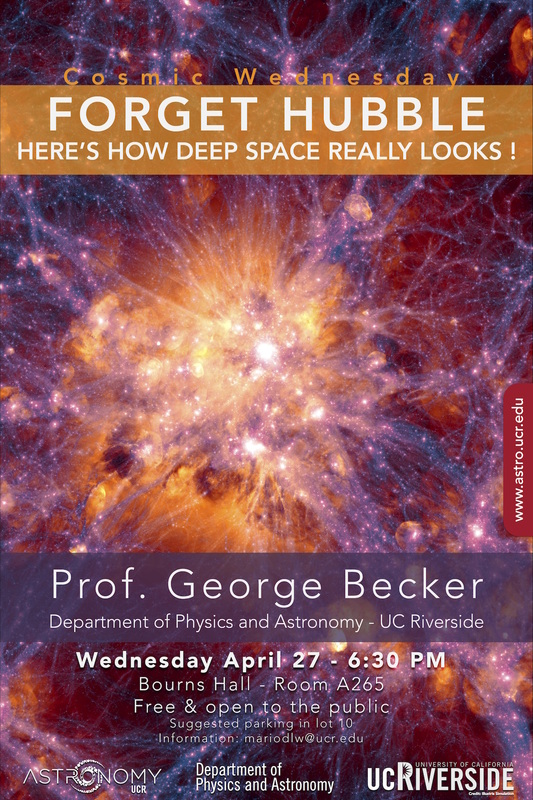 Prof. George Becker will talk on how although images of distant galaxies are often spectacular, yet most of the matter in the Universe isn’t found in galaxies at all, but in a “cosmic web” of dark matter and gas that stretches throughout deep space. The talk will discuss how astronomers study this material, and what it tells about how the Universe evolves and how galaxies are formed. Prof. Becker received his PhD from Caltech in 2006. He then held a brief postdoctoral position at the Carnegie Observatories in Pasadena, followed by fellowships at the University of Cambridge. After a year at the Space Telescope Science Institute in Baltimore, George joined the astronomy faculty at UCR in Fall 2015. The next talks will take place on May 26 and June 9.